Owners will never have to worry about re-painting the railings again. Slip resistant properties of FRP will provide additional safety for riders during entry and exit. Ontario Place, located along the Lake Ontario waterfront in Toronto, Canada, first opened its doors in 1971. The park was built as a showcase to represent the Province of Ontario. Ontario Place was built on three man-made islands spread over 96 acres. Throughout the years, Ontario Place has transformed into a park with award winning attractions appealing to family members of all ages. 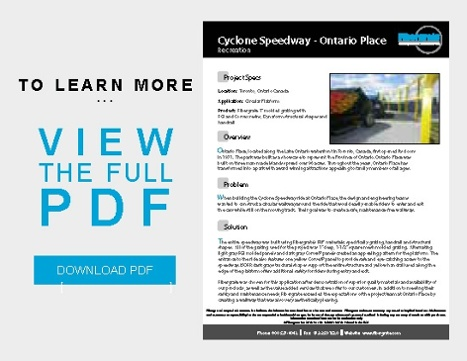 When building the Cyclone Speedway ride at Ontario Place, the design and engineering teams wanted to construct a circular walkway around the ride that would easily enable riders to enter and exit the cars while still on the moving track. Their goal was to create a safe, maintenance free walkway. The entire speedway was built using Fibergrate's FRP materials; specifically grating, railing and structural shapes. All of the FRP grating used for the project was 1" deep, 1-1/2" square mesh molded grating. Alternating light gray FGI-AM molded panels and dark gray Corvex® panels created an appealing pattern for the platform. The entrance to the ride also features one yellow Corvex® panel to provide safe and eye-catching access to the speedway. ISOFR dark gray structural shapes support the entire structure and yellow FRP railing used along the edge of the platform offers additional safety for riders during entry and exit. Fibergrate was chosen for this application after demonstration of superior quality materials and availability of our products, as well as the value added services that we offer to our customers. In addition to meeting their safety and maintenance needs, Fibergrate exceeded the expectations of the project team at Ontario Place by creating a walkway that was also very aesthetically pleasing.